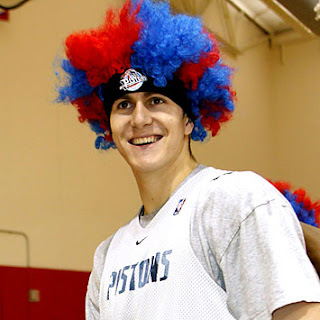 Verno and I were sitting together at last night's game against the Pistons, and to give you some background - I am a big-time Darko Hater. In our conversations, Verno continues to defend him, but it could just so he can be funny. You never know with Verno. Anyways, Darko hit a couple of his lefty hooks early in the first quarter. I continued to hate on Darko and promised Chris that Darko would disappear by the second quarter. He told me that Darko was "unstoppable". Then, with about 5 minutes left in the first quarter, Darko had 8 points with a plus-1 pending. 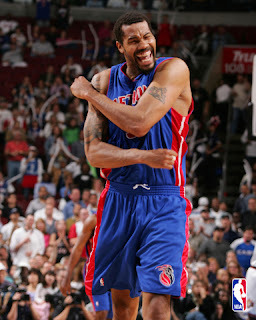 And Rasheed Wallace checked in to the game for the first time. Darko airballs the free throw. Darko finishes with 12 points, and was virtually non-existent for the rest of the game. Honestly, I have no idea how he got the other four points. Point is - Detroit is all up in his head, and all it took for Darko to go back to his shell was just a look at Rasheed Wallace. Darko's just damaged goods. Blame it on Larry Brown, blame it on the Eastern Bloc, whoever. Fact is, this was an experiment that I don't think is going to work out. And as far as I know, Rasheed Wallace is going to make the trip. Which means that at some point, 'Sheed is going to get a matchup against Pau. And then Pau is going to get embarrassed. Just watch. If at any point 'Sheed gets Pau on him at any point, he won't be able to get the ball fast enough. Then when he does, he's going to hit him once with his backside, and we'll have an opportunity for a new poster. Be sure to bring your camera phones. At least that's my opinion, maybe Pau will beef up tonight. Maybe be inspired with The Revenge of Darko opportunity. But I'm feeling that Pau's gonna get freaked out by 'Sheed's Spot and crumble. Alas. As for the evening's play: The Pistons are giving 5', and the public is HUGE on Detroit (like 75%). So, I am going to call on the spirit of Rudy Gay to possess the souls of everyone on the Memphis roster to play with some energy, and at least keep it close. And if not, we'll at least get to check out The Spot. No big surprise, as Tim Tebow won the Heisman Trophy Saturday night. The awards show was done at someplace called the Nokia Theater or Nokia Center or something. All I know is, the logistics of the place were awful. One of my favorite things to do every year is to check out the Heisman candidates' girlfriends in the row behind them and then guess which ones will get dropped by draft day. So this year, no cleat-chaser camera shots. VERY disappointing. 1) Tim Tebow rides a scooter. I guess when you are handily winning at life you can get away with this. But only if you are ahead 3 scores. 2) Colt Brennan wears jean shorts. Yes, he was wearing them when they were filming him on the beach. This could have kept him out of the top 2. Jean shorts are a definite negative. 3) ESPN chose NOT to show McFadden's pimped-out ride. If we are going to have this dude play second fiddle two years in a row, let's at least let everybody know that he's ridin' BIG. 4) Chase Daniel got a free trip to New York. Enjoy it while you can, bud. Then it's back to the farm in Southlake. And see if Eric Crouch can handle a plow - maybe put him to use. 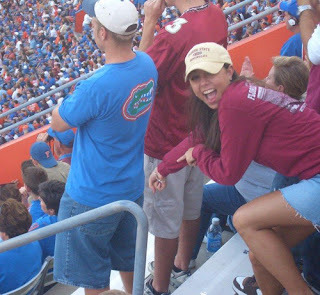 5) Unfortunately, no mention of the hallowed Tim Tebow Girlfriend. This is another reason why ESPN needs an alternate audio channel with just guys sitting around and talking about what's really on the mind of the viewer. Really, I've had enough with talk about the Cover 2 or a linebacker 'spying' a QB - I want the real story. Where is and who is this chick? And how can I pay her money to give me some attention? 6) Did June Jones make the trip? Can't say I saw him. Thought that was odd. 7) Houston Nutt sure looked good in that Arkassissippi-red tie. Way to play it down the middle, Houston. There had been talk about whether or not it was appropriate for him to be there, but that's ridiculous. Of course it was fine for him to be there. It also gets him on TV and associated with a Heisman candidate. Not necessarily terrible for recruiting. 8) In what might have been the worst speech ever, Tebow boasts 5 times that he "loves being a Gator". Let's be sure to enroll him in a speech class next semester. 9) Darren McFadden can finally make his great escape. The best player in college football can finally go to the NFL. Jon Roser Gets His, Or Is He Just Playin' Everybody? I must say that when Jon Roser, a 23 year-old young man was unable to put up 40 consecutive pushups, I thought that there was something funny going on. On Wednesday, he gets all the way to 39 and then gives up? That's weak. Extremely weak. So weak, in fact, that I believe that Roser THREW the first feat of strength so that his expectations would be lowered from then on. This all of course goes back to the proposed Roser v. Cowboy Caleb matchup, that when first approached, Jon Roser couldn't get in the ring fast enough. But when he found out that this actually COULD happen - he started running. And lowering expectations. When you look at this from the 50,000 foot view, you can plainly see that Roser is only protecting himself from his impending doom. Cowboy Caleb can, and will, mop the floor with Jon Roser's chin-stubble. Verno and I were actually trying to work up a way to guarantee that the fight would last more than 30 seconds. Because once Cowboy gets a hold of Roser, it's all over. That said, if Roser wants to train, I'm all for it, because it's better radio. That is, until he gives up his training regimen after he learns that powdered donuts aren't involved. I wonder what Roser's training regimen would be like. What I was hoping to be a very exciting Saturday night and early Sunday morning (college football-wise) left me wanting a little more. Yes, West Virginia and Mizzou lost. Tell me you couldn't see those coming from a mile away. And now we have the built in controversy on whether LSU should jump Georgia and get into the title game. I've had discussions with several people, and I could really see this going either way. But all we can do is sit and wait. Hey, its worked for Ohio State. As much fun as it is to try and guess what will happen with the national title game, my focus was elsewhere this weekend. I was absolutely POSITIVE that Les Miles was going to go to Michigan. Go ahead and throw me into the outhouse with Herbstreit. I just thought that it was a definite. And so that was going to leave coaching positions open at both LSU and Arkansas, with Tommy Tuberville playing everyone and anyone against each other. Rumors were rampant, even during Verno's show Thursday, I got a call from a radio station in Birmingham if we were the radio station that had information about a deal being done between Arkansas and Tubs. I said it wasn't us, but it definitely got me asking around even more. To add even more fuel to the fire, around midnight Thursday night I continued to get text messages from a few more sources that a Tubs/Arkansas deal was done. But Friday there was still nothing to report. And with Les Miles (apparently) staying in Baton Rouge, there is STILL NOTHING to report. The papers in Alabama are all now leaning that Tommy, though upset about the offer that Auburn has made, will probably stay on as coach. But it does lead me to wonder, in all of this - what is Arkansas up to?